Check in time for the Combo at 8:30 a.m. ENJOY THIS RARE MIXTURE OF EXCITING INGREDIENTS FOR THE BEST TOUR IN THE AREA. 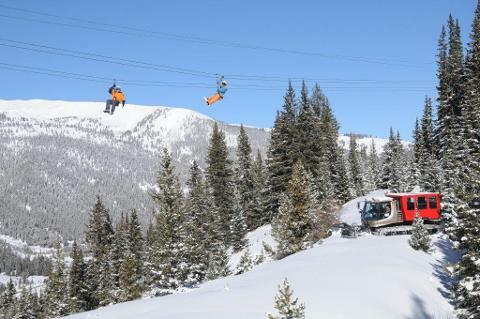 Customary Gratuities for Zip Line and Snowmobile Guides are not included in the Tour Price. Meet your trained and certified zip line guides. These friendly guys and gals will be with you for the entire zip line course. They have been trained on the course and are keen to make sure you feel happy, safe and unafraid. Guests say our zip line guides are great with Fraidy Cats and you'll feel more confident once you have completed the Safety briefing and training zip line before starting the course. We use different snow cat vehicles to get guests up the steep scenic winding mountain trails from Base Camp at 10,000' to the first departure deck at 11,500'. The type of shuttle vehicle depends on the snow and trails conditions. rest on six spacious landings. 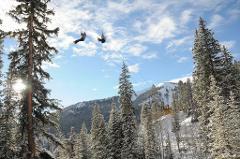 Pose for photos surrounded by some of the tallest mountains in North America. TOP OF THE ROCKIES IS INSPECTED ONCE A YEAR AND IS REGISTERED WITH THE STATE OF COLORADO. ZIP LINE RESTRICTIONS ON THIS TOUR: Maximum weight is 260 pounds. 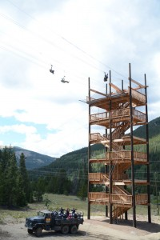 You must be able to walk short distances on downhill trails between the zip line areas. You must be in good health and not under the influence of alcohol or drugs. Pregnant ladies cannot zip line. All participants must present a credit card in the event of damage. 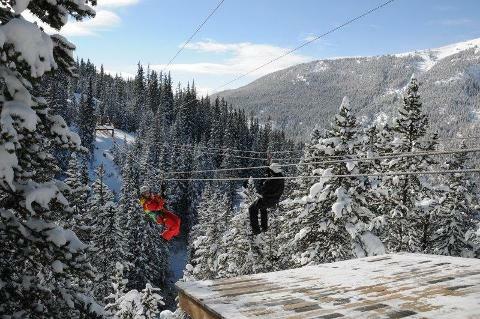 WHAT IS PROVIDED FOR THE ZIP LINE PORTION OF YOUR TOUR: Helmets, Harness and all necessary equipment, One piece coveralls and insulated boots in most sizes (although personal ski apparel and boots are perfectly acceptable). Bring sunglasses or goggles for eye protection. dividing into small groups. Ride steep rugged trails up to the top of the mountains then enjoy riding in snowy alpine meadows at the "top of the world" at altitudes from 10,000 to 12,500 feet. The Performance Tour is restricted to single riders, no passengers are allowed. Riders cannot be under the influence of drugs or alcohol. Pregnant Ladies Cannot Ride. All participants must sign a standard liability waiver before touring. All participants must provide a credit card to use in the event of damage. WHAT IS PROVIDED FOR THE SNOWMOBILE PORTION OF YOUR COMBO: Helmets (Ski Helmets are not acceptable). Complimentary Suits and Boots are available in most sizes. Bring Gloves, Goggles or sunglasses. Hot chocolate and other hot beverages are complimentary. 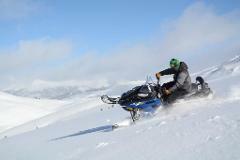 Gratuities for Snowmobile and Zip Line Guides are not included and at the discretion of guests.